We are proud to offer the famous Large (81mm) 'Drone Bee' Jewellery / Trinket Box (JB00022890). With so many on offer today, it is wise to have a make you can believe in. The Large (81mm) 'Drone Bee' Jewellery / Trinket Box (JB00022890) is certainly that and will be a perfect great bargain buy. 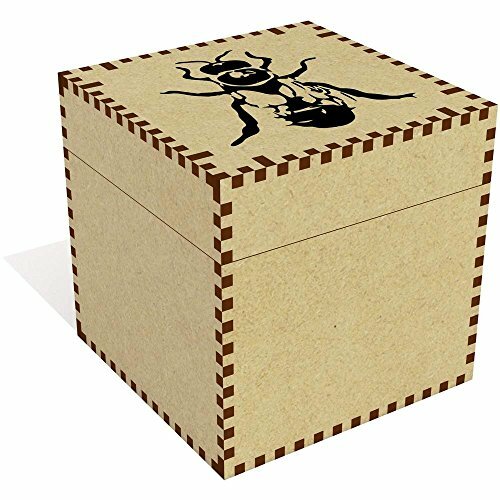 For this price, the Large (81mm) 'Drone Bee' Jewellery / Trinket Box (JB00022890) is highly respected and is a regular choice for most people. Azeeda have added some excellent touches and this means great value. This is a beautiful MDF jewellery / trinket box with a removable, flush fitting lid. They are ideal for holding small trinkets or favourite pieces of jewellery. Each trinket box has the lid printed with a design from one of our talented artists. The box is also ideal for decorating and pyrography. It can be painted, stained or varnished to your preference. The box itself is supplied unfinished (i.e. unvarnished) to facilitate this. You can always just leave it as it is if you prefer the natural look. This is one of three sizes of box we offer; they come in 39mm, 57mm and 81mm, marked as small, medium and large respectively. Each of the box sizes fit within each other as well to facilitate storage when not in use. The jewellery box is made out of 3mm MDF and comes flat packed - so it does require some assembly but no tools are required. This is easy enough to do but there's a web address with the product where assembly instructions are available. Once assembled, the box is quite robust - although it should be stressed that this is not a toy. As these boxes are laser cut for a precision finish, they can arrive with a freshly cut 'smoky' aroma to them. Unfortunately, this charming scent does fade over time. 81mm trinket box. Lid features a beautiful design Can be painted or decorated. Requires assembly before use - no glue or tools needed.